Premium putter maker Odyssey has a long history of asking 'how and why?' in its search for true innovation. Challenging preconceived ideas has served Odyssey well, with the company a formidable force in cutting-edge putter design and a frontrunner when it comes to introducing new concepts. 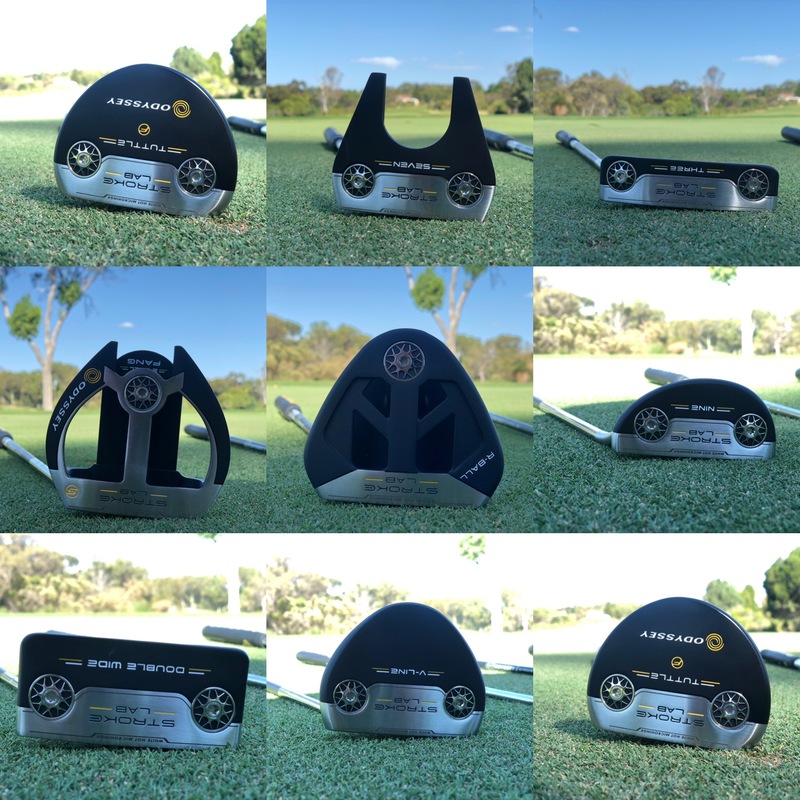 The new Odyssey Stroke Lab putter line-up applies the same approach, featuring a design ethos that flies in the face of conventional putters to produce game-changing flat stick performance. And with 10 new Odyssey Stroke Lab putters to choose from, the hole will be looking pretty big in 2019. Putters have long been a source of frustration for the majority of golfers, with inconsistent and unpredictable stroke paths the cause of many missed putts. The established thinking prior to the new Odyssey Stroke Lab putter range was to simply limit the impact of a dodgy stroke path. Previous putters relied on alignment aids and roll-enhancing features on the face to improve performance. They are reasonable ideas, but merely wallpaper over the cracks of a weak and inconsistent putting stroke. Enter the new Odyssey Stroke Lab putters, with a focus on actually improving a stroke’s weaknesses through an innovative new distribution of weight. A new multi-material shaft is the X-factor ingredient in the new Odyssey Stroke Lab putter line-up. The new shaft is a combination of graphite and steel and weighs in at a mere 75g, which is 40g lighter than a regular steel shaft. Freeing up that much weight meant Odyssey could re-write the rulebook on how weight is distributed, making it easier than ever to make a repeatable and consistent putting stroke. Another 10g of weight has been added to the putter heads through a pair of sole weights, while at the opposite end, a new grip which is 10g lighter has been equipped with a 40g counterweight. The multi-material shaft also concentrates most of the weight in the tip, with the heavier steel part of the shaft closest to the putter head. The shifting of mass in the Stroke Lab putters has a powerful effect and Odyssey’s research has demonstrated the putters will improve a putting stroke quite markedly. With more mass located near the putter head, golfers will obtain a heightened sense and feel of the putter head leading to a smoother and freer putting stroke that stays on the ideal stroke path effortlessly. The improved distribution of weight in the Stroke Lab putter range creates greater consistency and a more repeatable putting stroke, with Odyssey’s research indicating other improvements such as a straighter face angle at impact, enhanced tempo and greater ball speed control and accuracy. The new Stroke Lab shaft is also stiffer and has lower torque to counteract the weightier putter head. Stroke Lab putters also feature the famous White Hot face insert that encourages a top spinning ball roll. There are six mallets and four blade models in the new Odyssey Stroke Lab putter line-up and all can be fitted with either a pistol grip or Odyssey's oversize grip. #7: modified mallet with rear alignment wings. Double bend shaft or slant neck hosel. Marxman: face balanced perimeter-weighted mallet. Double bend shaft or slant neck hosel. 2-Ball Fang: perimeter-weighted mallet with famous 2-ball alignment system. Double bend shaft or slant neck hosel. R Ball: high MOI mallet, with only one ball showing of the 'two ball' alignment set-up. Double bend shaft or slant neck hosel. Tuttle: quirky turtle-shaped mallet with large domed rear section and three alignment lines. Double bend or flow neck hosel. V-Line: classic mallet shape, with double bend neck, centre shafted or slant hosel. Also comes in a V-Line Fang model with slant neck hosel. #2: classic Anser-style blade with full shaft offset hosel. #9: blade with large, rounded rear section. Double Wide: blade with elongated rear section. Flow neck hosel option also available.